The new Honda SH300i introduces a whole new level of style and elegance to the scooter market. Combining cutting edge design with the thrilling performance of a sports bike, Honda has created one of the most attractive commuters on two wheels. The SH300i has the strongest acceleration in its class, thanks to its compact and powerful 279cc fuel-injected engine. Incredibly fuel efficient, the SH300i also releases low emissions due to its cutting edge catalytic converter system. The SH300i was designed and manufactured in Italy to provide a luxurious commute for riders of all sizes, and comfortably caters for long rides. Easily seating two, the scooter features a contoured stepped seat and roomy step-through floorboard for plenty of legroom. The large 16 inch aluminium wheels allow for responsiveness and complete control at high speeds. The combined disc brakes provide a smooth balance of performance for easy, controlled braking operation. While style and comfort will make it hard to stop riding the SH300i, the 35 litre rear top box and nine litre fuel tank mean that there will always be an excuse to keep going. Stress-free to park and cheap to run; the SH300i is an extremely fun way to cut costs. The SH300i comes in Velvet Red Metallic and Pearl Montana Blue, and is available from Honda motorcycle dealers across the country for $8,990 RRP (includes GST, excludes on road costs). 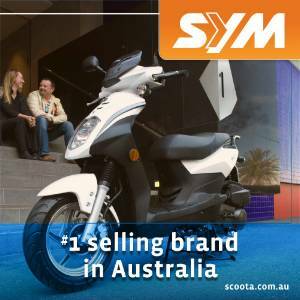 SYM Scoota retain the the title of being individually the highest selling brand in Australia for 2008. For the third year running SYM Scoota hold the proud position of No. 1 brand in Australia and we couldn't be happier! Last year saw a whole new set of challenges with rebranding Australia's favorite scoota from Bolwell Scoota to showcase our manufacturer's marques, SYM and PGO. We introduced the largest scoota in our range, the CityCom300i, as well as the Orbit 50 and 125 and the VS125 continued merrily each month as the number one selling scoota in the country! "We've finished the year in such a great position and are really looking forward to kicking more goals in 2009", says Tim Black National Sales Manager. "As a family business it is paramount that we continually build on the high levels of service, quality and back up everyone's come to expect from us." Set to launch in 2009 are more models to excite riders: a beautiful retro inspired 50cc and 125cc aptly named the "Classic" is due by March. There will be some bigger capacity models and a few surprises along the way. The next Survive the Ride Workshop will be taking place on the 2nd of February 2009. Its free, so if your in Sydney take advantage of these information sessions. On the back of a successful launch another free workshop has been organised for those wanting to gain a higher level of understanding on all things scootering. 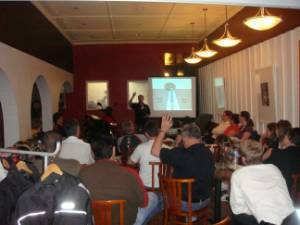 The nights are aimed at providing information for both new and and potential scooter riders along with those just wanting a refresher course. Plus all your questions will be answered on Sydney Parking, Tolls or anything else you might have on your mind at the time. See a range of Jackets, Gloves, Pants and Boots from leading manufacturers including ixon, Zues, Falco, Spidi, Nolan, Rivet, Draggin Jeans and Hornee Jeans plus many more. The Workshop usually start at 6:30pm and finish by 8:30 pm. Coffee and tea will be available. Information on these nights will be presented by David Tynan of the Survive the Ride Assoc of NSW. We were looking around at Vespa sites and came across yours via the community site. Great sites. 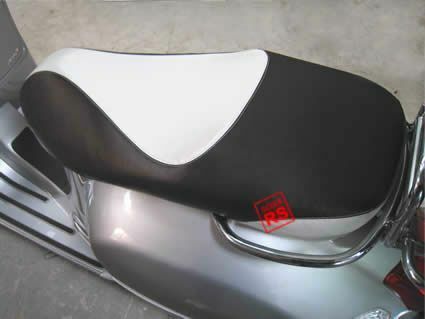 We wanted to get the word out to people that we've started making items for modern Vespas now, stainless bar ends, leather seat covers, stainless steel accessories, HID light system, etc. "The fit and finish is better than any other LX parts that I have gotten." We also have full scooter body decal sets, $21+, and Givi top cases, $60+, much less than elsewhere. We're adding new items constantly. If you have any suggestions, let us know. Several of the items were added after people contacted us recently. Go ahead and use any of the photos onsite if you want. If you could add a link for us, that would be great. Could be helpful for anybody with a similar issue and normally only shows itself when a top box is fitted. I certainly found that tyres had a huge effect on handling and normally would go for a Metzler conversion. But in this case a change to Pirelli solved the issue. 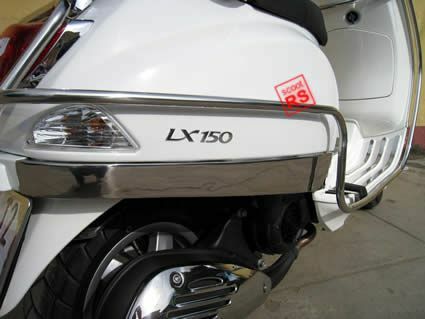 I’m a rider of a Vespa GTS250ie and have been so for the last two years. In that time I have travelled over 20,000 Ks. In general I love my GTS but right from the beginning I had this problem of handle bar oscillations when decelerating from about 40 kmh. Dealer could not fix it and in time I found that it was a common problem with the GTS and also the GT200. The Australian importers acknowledged the problem but had no solution. Said it was something peculiar to the combination of front suspension set-up coupled with the 12 inch wheel and made worse if a top box was fitted. I put it down to the left hand weight bias of the single sided suspension but the funny thing was that my wife’s LX150, which had the same single sided suspension set-up on the front, did not exhibit this problem at all. I tried raising and also lowering the rear end, extra heavy bar ends, checked the steering head bearings, tried Metzler tyres instead of the standard Savas. Nothing worked and in the end I just put up with it thinking that I would wait until a worthy scooter (with telescopic forks) came along with which I would replace the Vespa. Hearing that the Honda SH300 was about to be replaced I thought “at last that day had come”. Problem is that I was still waiting for the release and in the mean time my Vespa desperately needed new tyres. I thought I would try the Pirelli GTS tyres that are currently fitted to the new GTS300 Super. I had them fitted and to my surprise, the GTS wobbles seem to have disappeared completely and that’s with a top box fitted!!!! I’ve only done 100k’s on the new tyres, so maybe I’m jumping the gun a little but if I can do the next few thousand Ks without the dreaded wobbles, I will keep my Vespa and may even buy another one in the future. The name on these tyres is interesting because they are called Pirelli GTS 23 for the front and Pirelli GTS 24 for the rear. I don’t know if this implies that they were designed for the Vespa GTS but they certainly seem to work (at this stage anyway). I emailed this to you as I thought it might be of interest to all those GT/GTS riders out there that feel the same way I do about this problem. Citycom 300i now available in store for $6990 + ORC. Now available in store is the new Citycom 300i from SYM. The 264 cc Citycom 300i creates a scooter with the ability to not only carve up the city but with its increased capacity and torque this scooter should also be no stranger to the highway. The Citycom 300i was recently ridden by the Select Scoota team from Melbourne to Camerons Corner in Central Australia and return, just to prove how reliable and rideable it really is. Available in Silver, Black and Blue stocks are limited straight up so hurry in and see your local SYM dealer today. John Tate (see picture below) says he won't be swapping his mayoral robes for a motorbike helmet any time soon, despite spending the weekend on two wheels. The Lord Mayor of Newcastle and Northern Region Commander Assistant Commissioner Lee Shearer (right) spent the weekend away from their full-throttle jobs, attempting the practical course for their learner motorcycle licences. Motorcycle shop owner Graeme Boyd said Cr Tate takes part in the Newcastle toy run in December each year, and has been badgered for some time about learning to ride. Assistant Commissioner Shearer also took part after her husband recently bought a scooter. Mr Boyd said both were quite competent riders by the end of the two-day course. Cr Tate said yesterday he enjoyed the course, but doubted he would be replacing the mayoral car with a two-wheel version for his journey to Newcastle City Hall. "I don't think so . . . I've usually got too many things to bring along with me," he said. Cr Tate said Newcastle was on track to become one of the country's most motorcycle- and scooter-friendly cities. "We're going to have more people living in the city and with that there is scope for a lot of light bikes and scooters. "We are already providing parking spaces for light bikes and scooters." 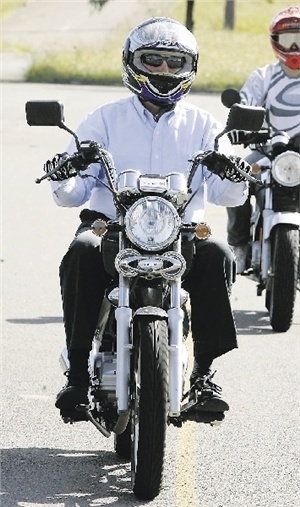 Motorcycle sales set a new record in 2008 with increasing numbers of Australians turning to two-wheeled transport. Official figures released by the Federal Chamber of Automotive Industries (FCAI) show that 134,112 motorcycles, scooters and all-terrain vehicles were sold last year - an increase of 3.2 per cent (4,146 units) over the previous record set in 2007. "This is an outstanding result and the highest sales figure on record," FCAI Chief Executive Andrew McKellar said. "Sales of motorcycles remained strong throughout 2008 despite the challenges and uncertainty caused by the global financial crisis," he said. "While the economic fundamentals will remain challenging in 2009 there are many good reasons why people will continue to turn to motorcycles and scooters for their transport requirements," Mr McKellar said. Road bikes were the key driver of growth in the marketplace during 2008 with 49,347 sales - an 8.5 per cent increase over the previous year. "The increasing array of motorcycles on the market means that there are models on offer to suit the varying tastes and needs of riders, whether it is for daily commuting or recreation," Mr McKellar said. Scooters remained extremely popular, with 15,364 units sold during 2008 - a 7.6 per cent increase compared to 2007. "Many people, particularly those who live and work in busy cities, are being drawn to scooters in record numbers because of their obvious convenience and practicality," Mr McKellar said. Sales of ATVs increased by 1.2 per cent during the year to 19,990 units, while sales of off-road motorcycles fell two per cent to 49,411 units. Honda maintained its market leadership in 2008 with 32,651 sales, followed by Yamaha with 28,004 and Suzuki with 18,314 sales. Cruisers retained leadership of the road-bike sub-segments with 13,156 sales ahead of 250cc (11,053 sales) and super sports (8,630). The off-road market was very competitive in 2008. Moto Cross was the most popular segment (14,410 sales), ahead of Mini bikes (14,129) and Enduro (14,124). The agricultural segment had the biggest involvement in ATV sales, accounting for 73 per cent of the ATV market (14,587 sales). Click here to open the comparison summary report. Click here to open the comparison top 10 report. There are exciting plans in the works on the environmental technology front with the announcement by Honda's President and CEO, Takeo Fukui, that the company is currently developing a battery-powered electric motorcycle which emits no CO2 during operation. According to Fukui, in order for Honda to sustain its business during the next 100 years of the automotive industry, the company will further strengthen its ability to continue advancing environmental technologies and to apply them to creative and attractive products. Honda believes the characteristics of a battery can be better utilized in the area of motorcycles, which are often used for short distance travel. In the pursuit of advanced environmental technologies for motorcycles, Honda has been developing and releasing products that use energy sources other than gasoline for quite some time. In fact, Honda has been developing electricity-powered scooters since the latter half of the 1980s. In 2004, Honda unveiled a fuel cell scooter prototype in addition to the hybrid scooter and electric moped developed as prototypes for eventual mass production. The Honda FC Stack, which was originally used in automobiles, was applied to the fuel cell scooter, after being made lighter and more compact to be the optimal size for scooters. The 50 cc hybrid scooter prototype employs both an internal combustion engine and an electric motor and provides ample storage space. 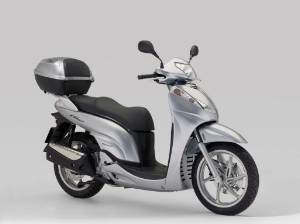 The electric moped has a built-in 360kW light nickel hydrogen battery inside an aluminium frame. Being powerful enough to climb a 12-degree incline, the electric moped offers performance comparable to that of a gasoline-powered moped. Honda is aiming to introduce the fully electric motorcycle to the market in approximately two years and envisages it could be viable for commercial as well as individual applications. Defying the doom and gloom merchants, Piaggio scooter brands continue to lead the growth in scooter sales. 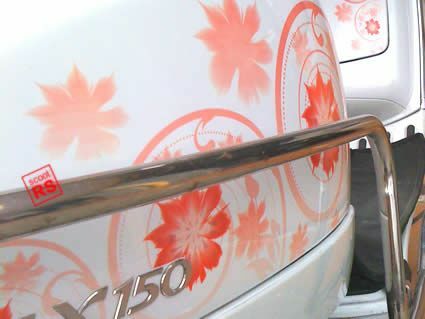 They finished 2008 strongly, further cementing their acceptance as the most chosen scooter brands on Australia with 3591 units purchased by commuters and enthusiasts alike. 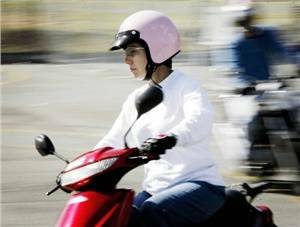 Comprising the Piaggio, Vespa and Gilera Brands, Piaggio appear to bucking a number of consumer trends in the challenging economic environment with the final ¼ being their strongest for 2008. 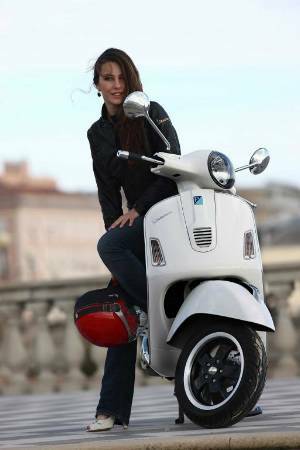 Piaggio increased sales by 44.7% over the previous year in a market that increased by 7.6%. 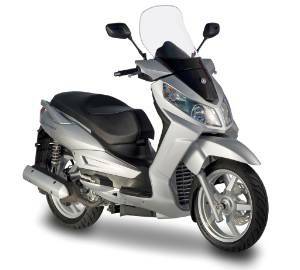 This provided Piaggio with an increase in market share from 17.4% to 23.4%. With fuel prices dipping below $1.00, many expected scooter sales would slow. Not the case says Simon Gloyne Piaggio’s brand Manager in Australia, “We understand why people might think that, but the factors that drove scooter growth in the past 6 years remain. An increase in apartment living, worsening traffic congestion, unreliable public transport, sky-rocketing parking costs, more concern for the environment & fun lifestyle choices have been strong influences for people to get on a scooter. Petrol prices may have come down but our owners still remain interested in reducing consumption and improving their quality of life. It’s never been more fun to do the right thing”. Closing out the year on another high, Piaggio also received the most coveted “Scooter of the Year” award from Scooter magazine for the Piaggio MP3 250 and MP3 400 models. Mr. Gloyne commented, “We’ve always known the unique 3-wheeled scooter provides unmatched benefits levels of safety and confidence. To have the leading Scooter publication recognise this is fantastic. We accept this award proudly”. Data Source: ERG December 2008 YTD.